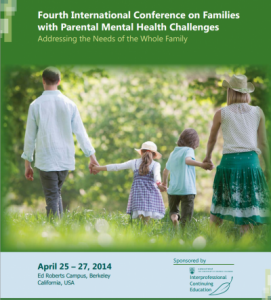 Child and Family Connections’ Executive Director, Evan Kaplan, is honored to be a keynote speaker at the 4th International Conference on Families with Parental Mental Health Challenges in Berkeley, California on Friday, April 25 – Sunday, April 27, 2014. This important conference is bringing together parents and experts from around the globe to learn and share their knowledge and experience to advance the rights and highlight the needs of families striving to live well with parental mental health challenges. This is a rare opportunity and the first time the conference has been held in the United States. Please consider joining Child and Family Connections at the conference. This 2.5 day conference will begin with an evening of networking. For the remainder of the conference, presentations and panels will be held both on specific themes and cross theme areas. We will be providing opportunities during the conference for people to gather formally and informally to discuss issues of common concern. For more information, email us at info@childfamilyconnections.org. You can also download a copy of the conference brochure here.